I am also writing to you as one word lover to another. My new novel, THE GRAMMARIANS, is coming out in September. It’s a novel about words! 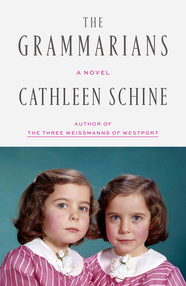 Well, it’s about the lives of identical twin sisters who are obsessed, enchanted and devoted to words–a love letter to sibling rivalry and the English language. So if you’re a word-nerd, a sister, have a sister, have ever had an argument about the Oxford comma, or just want a book in which a child tries to take Merriam Webster’s New International Dictionary, Second Edition to bed at night so it won’t be lonely, you might enjoy THE GRAMMARIANS. I hope so, anyway! THE GRAMMARIANS goes on sale September 3, 2019 from Sarah Crichton Books.